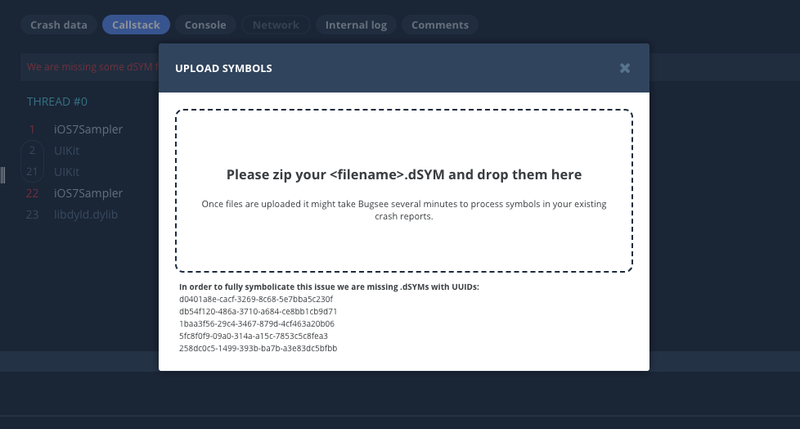 Bugsee is able to properly process and symbolicate crash reports that are uploaded from your users. Even if your binary has its symbol stripped, Bugsee will do wonders guessing the right symbols. 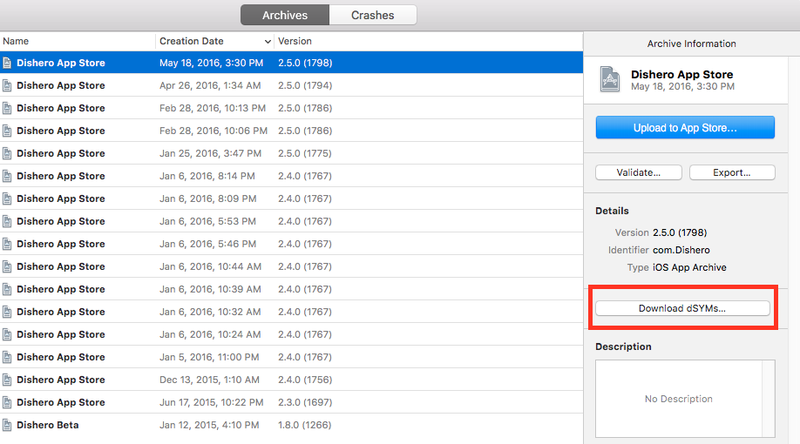 In some cases it might be enough to root cause the problem, however best results will be achieved when Bugsee can match a crash report with a symbol file (dSYM) of crashed build. Bugsee can automatically upload dSYM files during the build phase. The system is smart enough to match the right dSYM to a crash report. 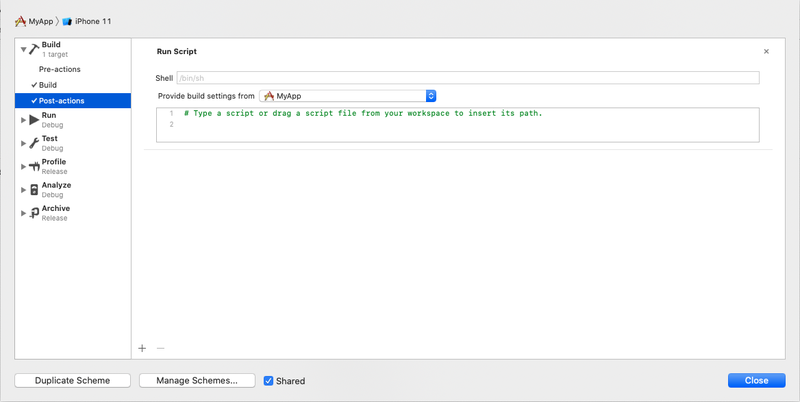 Edit your scheme by going to Product->Scheme->Edit Scheme. echo "Error: BugseeAgent script not found !!!" echo "If you link Bugsee.framework from outside the project folder, please copy the script"
echo "into your main project directory or manually update SCRIPT_SRC variable with the right path"
The script above finds the BugseeAgent helper utility within your project folder (location may vary). For optimization purposes you can modify the script with the direct link to BugseeAgent in your particular folder structure. Note that for platforms like React Native, BugseeAgent is located in node_modules directory which is one-level up from the project directory. Don't forget to reflect that in script above by appending "/../" to the $PROJECT_DIR variable. Once a dSYM file is uploaded manually, we are going to re-process old issues related to that specific build, the process might take some time, usually several minutes. Go to your Xcode Organizer, point to the build you submitted and click on the “Download symbols"
Inside the dSYM folder you should find several files which correspond to symbol files for different architectures. Compress them and upload them following the procedure for manual dSYM uploading. Upload the zip file you just downloaded directly to Bugsee by following the procedure for manual dSYM uploading. If your build has multiple architectures and/or multiple binary files, all the dSYM files are already included in the zip file and will be processed automatically. 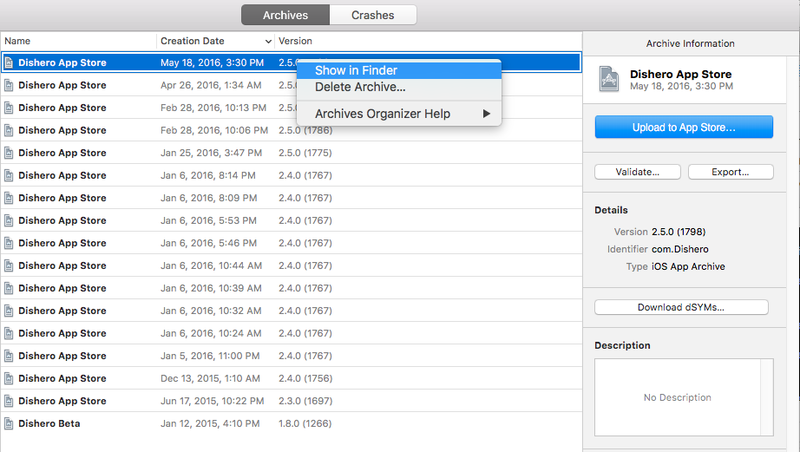 Bugsee supports fastlane for uploading dSYM files by providing a fastlane plugin with upload_symbols_to_bugsee action.